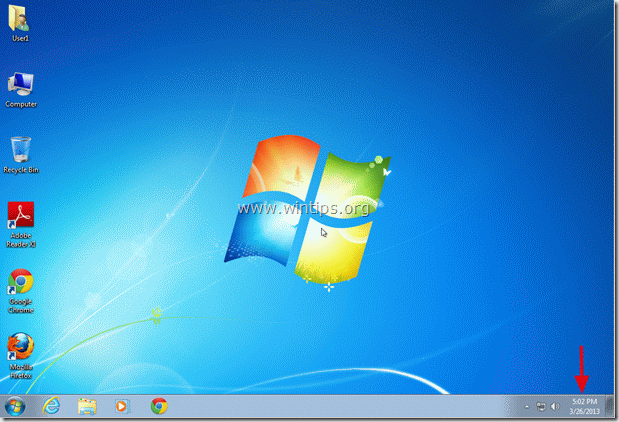 This tutorial is a short solution if you receive the error 0x80070003 or 0x80070002, when you try to install Windows updates inside Windows 8, 7 or vista. The above error(s) happens when your computer has wrong date/time settings or when Windows update temporary folder is corrupted. To resolve these errors, follow the solution given below. Method 1: Check you date and time settings. Ensure sure that your computer's date and time are correct. b. 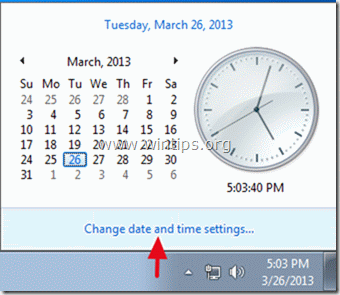 In the window that opens, click on “Change date and time settings”. 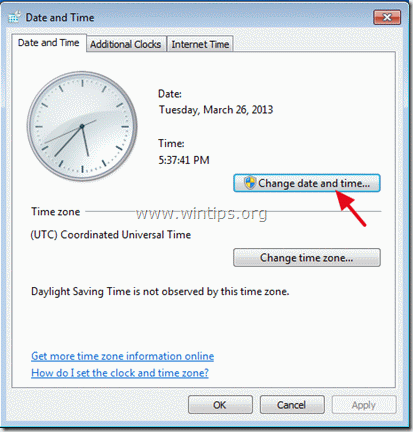 c. Press “Change date and time” to ensure that you have setup the correct date/time/year in your computer. 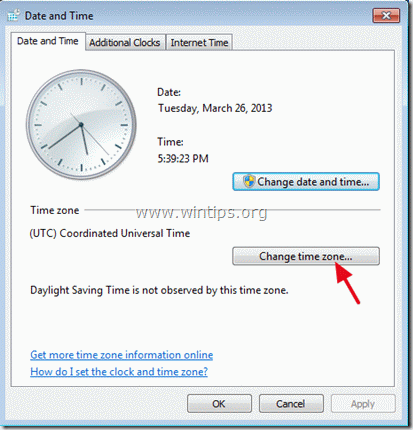 d. When finished with date/time, press “Change time zone” to ensure that you have the proper time zone. e. Restart your computer and try to update your computer. If the problem persists, proceed to the next method. a. Simultaneously press Windows key + R to open run command box. 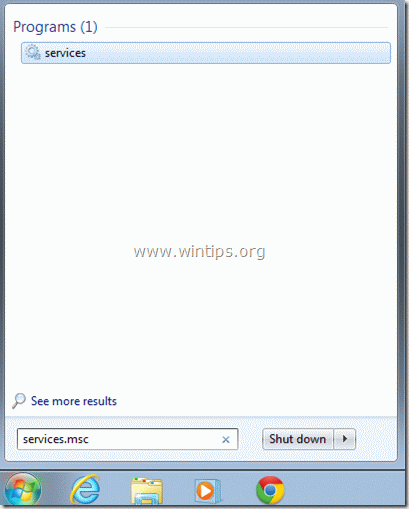 c. Search for Windows Update service, then right click on it and select Stop. Step 2: Rename Windows update folder. a. Open “My Computer” and navigate to “C:\Windows” folder. b. 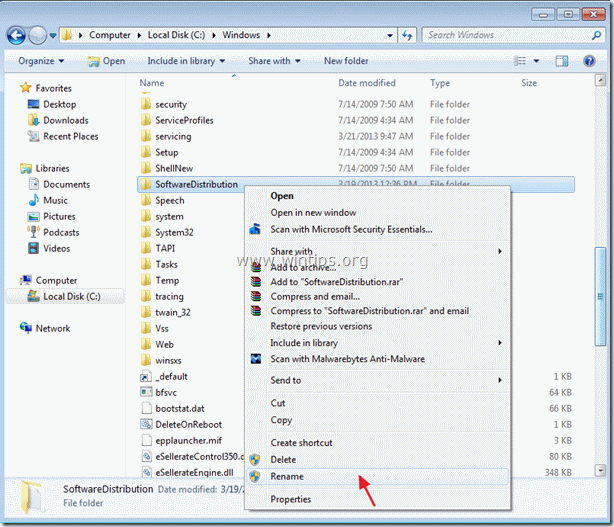 Find and right click on “SoftwareDistribution” folder and choose rename. 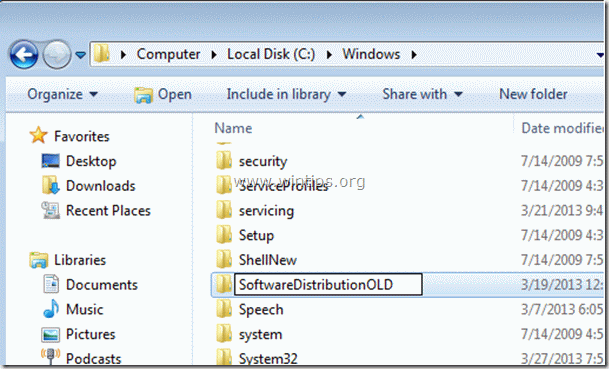 c: Rename the “SoftwareDistribution” folder to “SoftwareDistributionOLD” and press Enter. d. Ask “YES” to UAC warning and continue to next step. Step 3: Start Windows Update service, and try to update your computer. Download and run Microsoft Fix it 50202 and then try to update your computer. Thank you so much for this excellent solution. Very nice. Thanx for give this value able sollution. Thank you ……. Step 2 … work for me……. time was ok, the other steps made it work finally, but it took a while (4 hours) before update could be installed. Thx a lot. I am getting this error code when I try to setup Outlook 2010. I had to let Windows Update do an automatic update. The manual would hang forever. I truly believe MS is behind this somehow. I am running Windows 7. This was a clean install with a DOS format, long version. I have nothing installed but Office 2010 installed, CCleaner and zone alarm. Nothing else. Can you help? 2. Then make sure that you have already installed Internet Explorer 11 on your computer. 3. 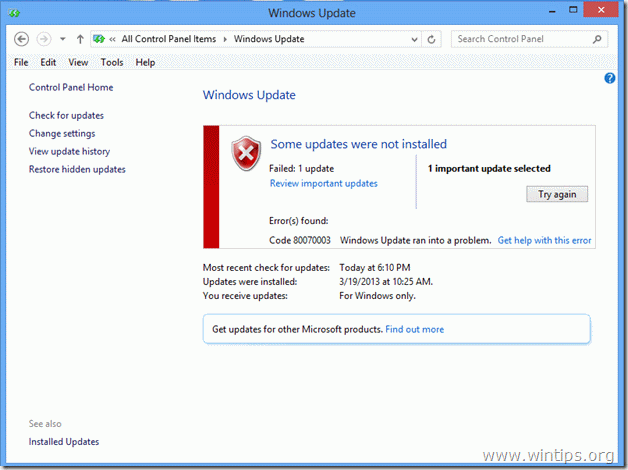 Download and install the KB3102810 security update according your OS version *. (If installation hangs, restart the computer and then immediately install the Update). 4. Restart your computer and then delete the "SoftwareDistribution" folder by following the instructions on Method 1 above. 5. Restart your computer and check for updates. I was trying to install LSRT on my windows lapi but somehow unable to install it. Getting error notification as “The system cannot find the specified file. (0x80070002)”. Downloaded LSRT from Microsoft link. Really fade up off these thing..
Issue was stared with my phone after os update and since then my phone is not even taking breath. Please can someone update me with above things. Hi All, I get the error 0x80070002 when I try to make a systemimage of my OS window 7 home premium. Your help in this is ver appreciate it. 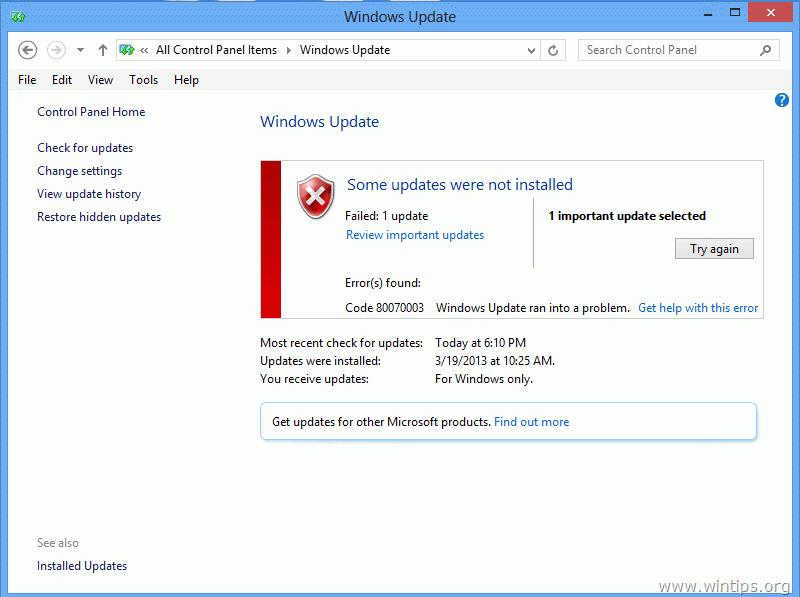 @Vinay: Download and install the "System Update Readiness tool"
I have also encountered the error 80070003. I bought new laptop HP pavilion ab032tx last week. I tried to upgrade to win10 by "get windows 10 app". But during installation I got the error code 80070003. Then i tried through Mediacreationtools. In this process i got below mentioned steps. During installing, it goes till 22% & then suddenly one window pops up saying " something happened. Installation failed"
So I tried all ways & i tried more than 15 times. I renamed the software distribution folder as well. I deleted some .edb files. @kinkon: 1. 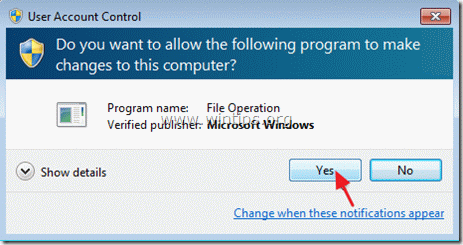 First Uninstall or Disable any antivirus software. 4. At "Administrative" tab, click the "Change system locale" button. 5. Select "English (US)" from the drop-down menu and then click OK.
6. Then click on "Copy Settings" button and check the checkboxes "Welcome screen and system accounts" & "New user accounts". 7. Run the Media Creation tool as Administrator. This worked great for windows 10 update on second option, thanks! Alas, doesn't work for me. Running Windows 8.1. When I try the Fix-it 50202 program, I get an error message saying that it doesn't work in my version of Windows. 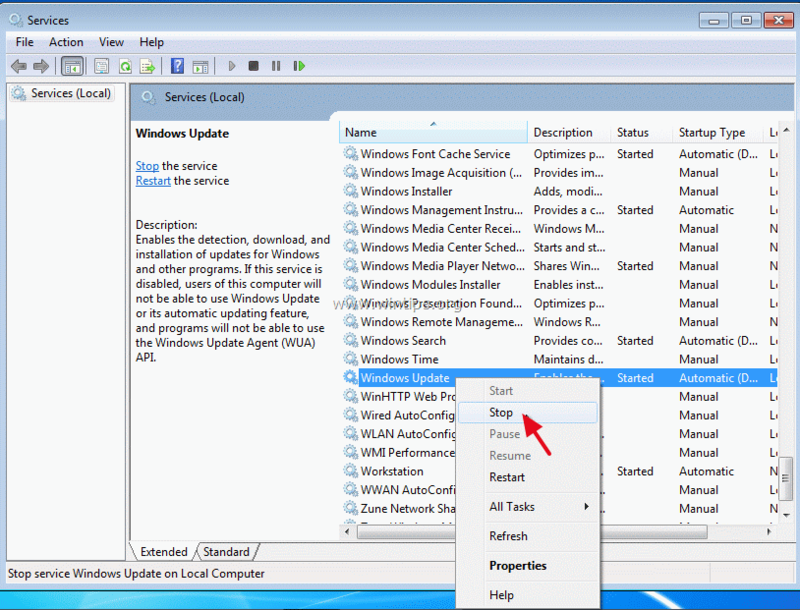 @vicky: Try to reset Windows Update Components. I took screenshots of the long version fix and worked my way through. I'm so pleased to advise my Windows Updates are now working! Thanks so much. Hi there I too had a very stubborn Windows Update problem (error 0x80070003 / Win 8.1 Home), and was finally able to fix it. This led me to look in the C:\Windows\Servicing directory, and I noticed that the Sessions folder did not exist. Or more accurately, there was a *file* called Sessions – apparently a corrupted version of the folder (dated about the time when updates stopped working). I compared this to a working installation of Windows on another laptop, and saw that the folder did exist, and contained many xml files. After playing around with the permissions I recreated the Sessions folder, tried again to (manually) install updates – and – it worked! So far I have been able to install upates, both manually and using the Control Panel. The moral is, I think, take a close look at the CBS.log file and follow any leads it gives. It's beyond me how the sfc and the DISM tool could fail to detect this problem. I'm guessing they both saw the "Sessions" file, and figured all was well. Not sure if my situation applies to anyone else, but just in case, here it is. The second method works great for me. Thanks a lot !!! For me nothing of the really good tips worked. But I could solve the problem. I've installed another Netwok Card and the updates are running fine. Don't know, if a bad driver (possibly installed via Windows update) or a cheesy network onboard chip was the cause. Thank you very much!!! The first method worked great. Nothing works for me. I am STUMPED !! THANXS…. “The Microsoft Fix it 50202 Tool”…..Worked great, resolved the update error problem, my PC has now installed all the latest updates, no problem..saved a lot of time and effort. thank you so much for this post, been struggling with my new Lumia 2520 refusing to update \, after trying option 2 and restart everything work :). just one question can I delete the old file softwaredistributionold?. Hello Ali, yes you can delete the old file (softwaredistributionold). What an asinine comment. My Windows IS Genuine and I still got the 80070003 error. Method 2 Worked – thank SO much. Clear, concise, exact. all 3 methods did not work for me. I have tried all three options several times and I still get the error. Are there any more options? I have tried this tool a few times now. Every time I try to run it I get an error that states: "Installer encountered an error: 0x8007000d The data is invalid." 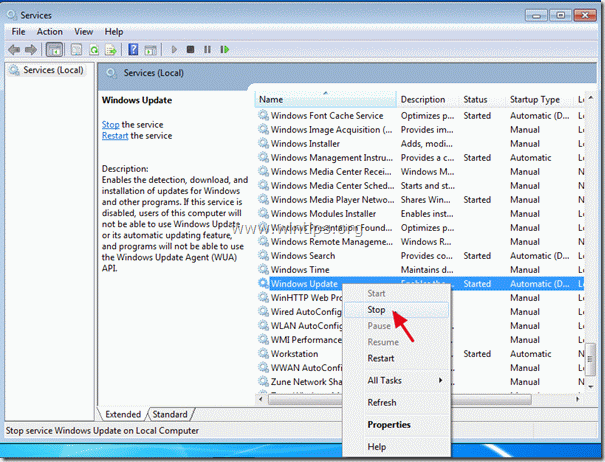 Otherwise, restore your PC to an earlier restore point and then try to update Windows again. Hi .. where would i find this? I tried this: So if you have this maybe this will work for you I tried quite a path with all having the same apparent result with the error 8024402F Coming up. NOW CLICK THE UPDATE BUTTON SURPRISE SURPRISE YOU NOW CAN UPDATE.!!!!! After updating ,check for further updates after the first batch. Then the settings can be put back to normal eg Receive updates Automatically, the tick the other two boxes. which corrected it in part. that was until i Re-ticked the last two boxes. again was unable to update. so i tried anticking one box at a time. and found when the last box was not ticked (where windows recommend other updates for windows programmers) and it was able to update. Hello Andy, glad to hear that you solve your problem. 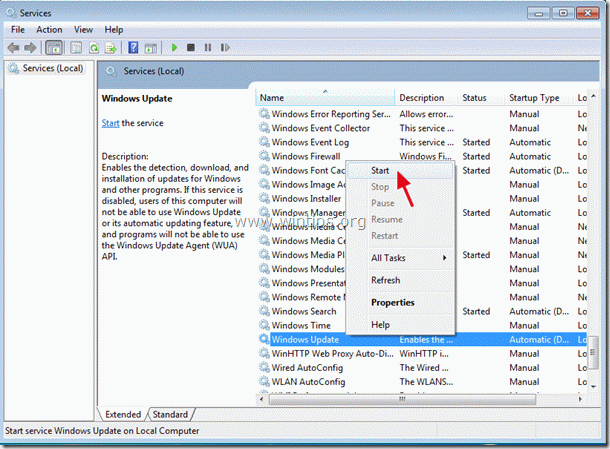 If you like to try my suggestion then you can find and uninstall the “Microsoft .NET Framework 4 Client Profile” From "Programs and Features" (Control Panel > Programs And Features). Hello Andy, try this: Uninstall the "Microsoft .NET Framework 4 Client Profile" from your computer, and perform a restart. Then try to update Windows again. Bloody well for now!!! After stoping sevice and reanaming the folder and starting service again I see changes. Now I'm going to restart windows. God bless you! Thank you. I had to rename the folder and then reboot but after that, the frustrating problem was been solved. You've helped solve an issue that's been bugging me for more than a month and until now I'd been unable to find a remedy and one that was very easy to follow and implement. Thanks again. thank you very much.. it worked!! Which way did you used. I am using windows 7 Ultimate, we have update Chinese ,Japanese, Korean except English. i have tried many times but still failed. And I will try the solution here later. Hope can fix. My HP says that the file cannot be renamed because it is in use in another application. HELP. Boot Windows in Safe mode and then try the operation again. (Using all steps in Method 2). When finish reboot your computer and try to update again. You would have had to exit out of the services window…..
None of these worked for me. I am still getting the same error code. microsoft fix it 50202 did a splendid job, Halleluiah!!!. Thank you. The first method works great for me. Thanks !! !